What a busy week guys! Thanks to all of you for the wonderful response to my Chocolate & Goat Cheese Cupcakes! I also want to thank Raycom news and reporter Joseph Neese for the feature, and you can check out the story here. Today's post is another reader request, this time for coffee cookies. 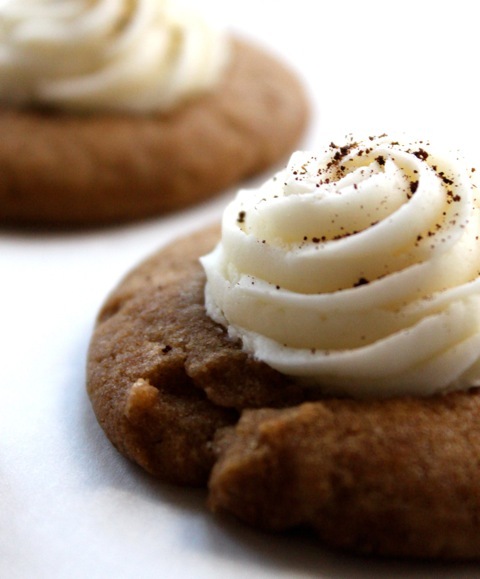 This mascarpone coffee cookie is one not to be missed! It has a rich coffee flavor, and the addition of mascarpone adds a delectable creaminess that will keep you going back for more. This cookie is one of my favorites, and one I go back to often. You will notice that I use a product called Trablit in the cookie dough. Trablit is a premium coffee extract that I was first introduced to in pastry school. It is a bit on the pricey side, but it's one of those products I think is worth the investment. If you don't have it, you can definitely substitute any coffee extract. Some Kahlua would work very nicely too! The other key ingredient here is the mascarpone. It just adds a wonderful richness to the cookie while keeping it incredibly light. While I usually make a dark chocolate ganache to pipe in the center of these cookies, this time I went with a white chocolate cinnamon ganache. I steeped a cinnamon stick in the heavy cream while preparing the ganache which added a lovely layer of flavor. The cookie itself is not very sweet, so the white chocolate pairs well with it. Whether you add ganache to these cookies, or leave them as is, they are sure to be a hit. Finished off with a dusting of instant espresso powder, they are the perfect little pick-me-up to get you through the day! Have a great weekend! Latest: Two Twix Fudgy "Whitie"
Coffee cookies! No this is something I could eat tons of...not to mention the fact that they have frosting on them! Me too.. & the frosting gets me every time! I would inhale these, and in the morning too since they have coffee in them and all! :) That's my excuse. I bet these would be great with kahlua, so pretty! I like that excuse! Thanks Lacy! Whoa. So this is kinda like a tiramisu cookies?? Please send me a dozen asap! They look so delicious. The perfect sweet treat! Yes, just like a tiramisu cookie! This is a great blend of flavors. I do not think I have ever seen marscapone used in or on a cookie before-very creative. Also thanks for the info on the trablit-sometimes there are just so many flavorings out there it is hard to decide which is best. Great recipe and nice to find my cream and coffee in a cookie form! Enjoy the weekend! Thanks Tina, hope you are having a great weekend! What adorable little cakes :) I love mascarpone, so these would be a perfect treat for me. These sound amazing Meghan! I love this combination...so perfect! I have never seen mascarpone used in cookies. I guess the flavor must be similar to tiramissu since both contain coffee in it. Thanks for the recipe! Thanks Amalia, I love coffee in baked goods too! Hope you're having a great weekend! These look SO good!! I'm all about that frosting on top! Oh my, these cookies look fabulous! I forgot to tell you that I love the new look of your blog! I want to run to the store right now so that I can make that marscapone ganache! These cookies sound so delicious! I can only imagine the wonderful texture the mascarpone gives the cookies and the white chocolate cinnamon ganache is the perfect topper! So elegant! The cookies are fabulous themselves, but the white chocolate ganache just pushes them over the top! Brava! As usual, a LOVELY dessert... I can almost taste the marscapone! Ooo, these are great! Love the dollop of mascarpone on top. You have a few of my favorite things in the world here...and then a cookie too! These are fantastic! It's hard to wow me lately...but this did it. My husband will LOVE me making these cookies :-) Thanks for sharing! Um, I can't even tell you how much I love that there is mascarpone is these cookies. I can not wait to try this! Hope you enjoy them Sarah! So sinful looking! How divine! Okay... I will be making these too! They look absolutely delicious! Ooh, what I really want to do with these is sandwich the ganache between two cookies to make Marscapone Coffee Whoopies. Thanks Meghan!